We are pleased to offer to guests (staying 3 or more nights) a complimentary pass to one of the three famous Ashley River Plantations. If you love history and architecture, you'll love this early 18th century Palladian plantation house. Managed by the National Trust for Historic Preservation, Drayton Hall is a National Historic Landmark that offers a glimpse back in time. The house is unfurnished, but the guided tour is top-notch and inspiring. A gift shop is on-site. Middleton Place is a National Historic Landmark and offers stunning gardens, a museum house, and stableyards (with animals and a weaver, cooper, carpenter, potter and blacksmith at work demonstrating the skills practiced by enslaved people). There is an excellent restaurant on-site and a gift shop. Magnolia Plantation and Gardens is the oldest public tourist site in the Lowcountry, and the oldest public gardens in America, opening its doors to visitors in 1870. You can tour the gardens and choose additional attractions within the property such as the Nature Train, Nature Boat, Audubon Swamp Garden, House Tour, and a Slavery to Freedom Tour. We offer a "Self-Catering" option for those guests who might like to make their own breakfast (and other meals). 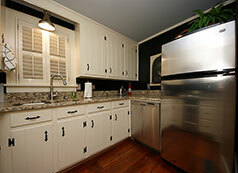 The Cottage's full kitchen makes this a workable option with a stove/oven, refrigerator, microwave, and dishwasher. The cupboards are stocked with dishes, flatware, and cooking utensils. Once a week linen service is included. A one week minimum stay is required (at a special rate) and reservations should be made in advance directly with the innkeepers. You can call 843-871-1877 to inquire about availability.